Centenaire is a short walk west from the luxury four-star Hotel La Perouse. 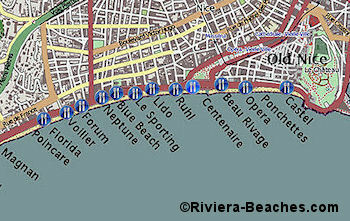 The closest bus stop is Albert 1er, across the Promenade. There you'll find buses 8, 11, 52, 59, 60, 70, 94, 98, 200, 230, 400, 500. 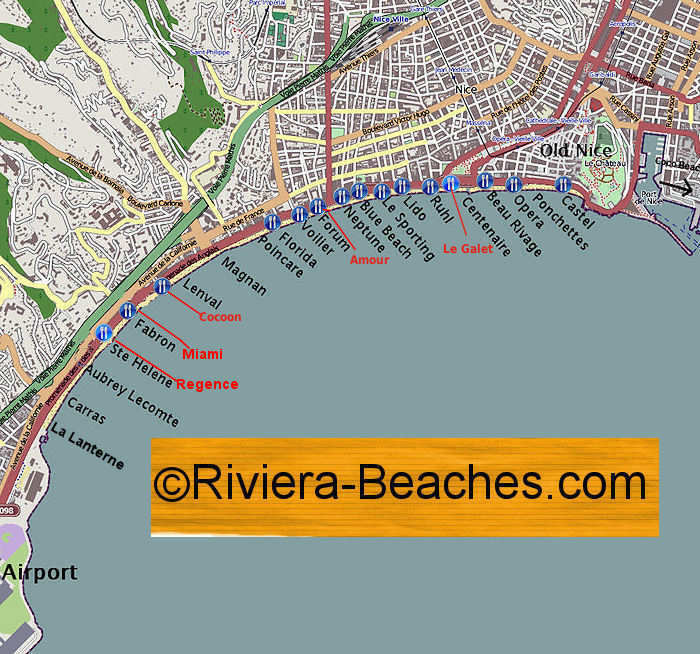 Although there's nothing within sight of the beach, just cross the Promenade to av des Phociennes for a cafe-restaurant or walk a few blocks east to enter the Old Town and its vast array of dining possibilities. There's a public and wheelchair-accessible toilet at the back of Centenaire beach. Parking is extremely limited here, at least until construction of the parking space across from Beau Rivage beach is completed. Centenaire is a safe beach but the water can become cloudy and unappealing when the Peillon river is running high after a storm. Most people prefer to swim in an area away from the river's flow. Centenaire has a lifeguard on duty from mid-June to mid-September. See more about lifeguards.